Google is down with New York City. So down, in fact, that the web search titan just dropped $1.9 billion to acquire one of the largest and most historic buildings in all of the Big Apple. 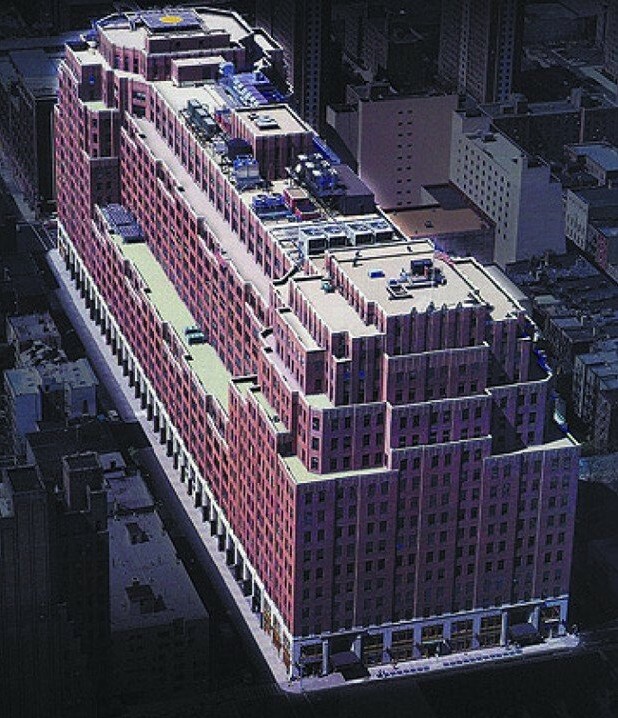 At nearly 3 million square feet, 111 Eighth Avenue, the former Port Authority building, sits like a beached, red-brick cruise ship overlooking New York’s Chelsea neighborhood. The building is so big, in fact, that it has elevators large enough to accommodate 18-wheel semi-trucks. 111 Eighth Avenue was designed by Lusby Simpson and completed in 1932, just one year after the Empire State Building and the Chrysler Building. In fact, one way to think about 111 Eighth Avenue is like the Empire State Building on its side. It’s worth noting that the Empire State Building has just over 2 million square feet of office space — about 1 million less than 111 Eighth Avenue. But 111 Eighth Avenue is no ordinary humongous building. As it happens, the structure sits almost directly on top of where the Hudson Street/Ninth Avenue fiber highway makes a dog-leg to the right before heading north-east toward the Upper West Side. In New York City, fiber-optic cables travel in large bundles underneath the asphalt. The building’s previous owners, a consortium led by Taconic Investment Partners, knew that proximity to the fiber-line would be attractive to companies, so they tricked out the building with something called a network-neutral “Meet-Me” room, which is literally a room filled with networking equipment that allows the tenants to connect with each other — and the fiber-line.